Most renal disease causes no symptoms until 50-75% of kidney function is destroyed. Lab tests often provide the initial recognition of renal impairment and can be used to direct further therapy. In therapeutics, knowledge of renal function is essential for recommending proper doses of prescription drugs. Many drugs are renally cleared and decreased renal clearance can lead to toxicity. Dose adjustments are based on assessments of renal function. The excretory function of the kidney serves to rid the body of undesirable end products of metabolism. One of these groups, the non-protein nitrogenous (NPN) compounds, is listed in Table 1. The two most popular screening tests for renal function are serum urea nitrogen and serum creatinine. Better measures of glomerular function are clearance tests. This is especially true in the aged, where serum creatinine measurements are less reliable due to decreasing muscle mass. In uremia (kidney failure) the increase is mainly in urea, creatinine and uric acid. Uric acid and the other NPN-compounds are measured rarely in this context. Serum urea nitrogen (SUN) is normally ~45% of total NPN, but may be 80% of NPN in some disease states. In hepatic failure the ratio of non-urea/urea nitrogen increases, because of the inability of the liver to synthesize urea and to deaminate amino acids. Historically, urea was reported as blood urea nitrogen (BUN) and this terminology has been incorrectly carried over to the present. Urea nitrogen is now measured using serum and is reported as “serum urea nitrogen” (SUN). Urea is synthesized mostly in the liver as a by-product of the deamination of amino acids arising from protein catabolism. Urea is filtered by the glomeruli; however, about 40-70% (amount depends on urine flow) is reabsorbed by passive diffusion into blood across the renal tubular epithelium. Thus, in conditions in which the glomerular filtration rate is decreased, SUN will be increased. For this reason, urea clearance tests are less informative than creatinine clearance tests and have been discontinued. The serum urea nitrogen level is greatly influenced by diet. SUN is not a sensitive indicator of renal dysfunction because renal function must be reduced by more than 50% to result in a rise of SUN. Daily excretion is fairly constant and independent of urinary volume. Thus, this measurement can be used to assess the relative completeness of a 24-hour urine collection. Patients with hepatic disease, muscular dystrophy, paraplegia and poliomyelitis may excrete less creatinine due to decreased production. It should be noted that many laboratories use alkaline picrate (Jaffe) method for measuring creatinine. Note: Creatinine production is based on weight and gender that is generally related to muscle mass. Thus, be circumspect when treating individuals with a high normal creatinine when a low creatinine is appropriate due to small muscle mass. This would include children, elderly, women, paralyzed patients, and amputees. Since creatinine clearance is related to patient size, a more accurate formula includes an estimation of body surface area in square meters obtained from a nomogram using the height and weight of the patient. A = body surface area in m2, and 1.73 m2 is the average body surface area. In essence this formula “normalizes” the clearance to that of a normal-sized person. Patients being tested for the GFR must be well hydrated to provide a urine flow of > 2 mL/ min. The relationship between serum creatinine and creatinine clearance is logarithmic (see Figure 1). Thus, initially, for small numeric changes in serum creatinine, there are significant numeric changes for creatinine clearance. In later stages of uremia, small numeric changes in the clearance are associated with significant changes in serum creatinine. Note the decrease in the number of nephrons with decrease of clearance and increase in serum creatinine. Figure 1: Correlation of Plasma Creatinine and Creatinine Clearance. 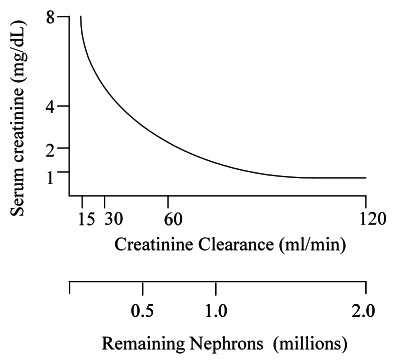 Relationship between serum creatinine, creatinine clearance and number of remaining nephrons. The endogenous creatinine clearance rate is primarily an estimate of GFR; however, a small amount of tubular secretion augments glomerular filtration. Therefore, total urinary creatinine is slightly higher than the amount actually filtered by the glomeruli. The amount of urinary creatinine derived from tubular secretion rises proportionally in renal failure with an increase in serum creatinine. With advancing renal failure and increase in serum creatinine, the tubular secretion proportionally increases up to 40-60%. From an interpretation standpoint this is important. With normal or early renal failure creatinine clearance approximates true GFR. With advanced renal failure creatinine clearance overestimates true GFR, which is because of the increased amount of creatinine in urine due to tubular secretion, which in turn is caused by the high concentration of creatinine in circulation. Alternatively, more accurate isotopic methods for measuring GFR can be utilized, e.g. the clearance of injected 51Cr-labelled EDTA from the blood. This compound is completely filtered by the glomeruli and is not secreted or reabsorbed by the tubules. However, this method requires a special laboratory equipped to handle and measure radioactive isotopes. An alternative to measuring GFR is to use the Cockroft and Gault equation to estimate creatinine clearance based on a single measurement of serum creatinine. Where Screat is serum creatinine (mg/dL) and weight is in kilograms. The most often used function tests are renal concentrating power and the ability to produce an acid urine (in suspected renal tubular acidosis). Osmolality refers to the concentration of osmotically active particles (osmolutes) in solution, expressed in mOsm/kg of water. Urine osmolality varies widely in health, between about 60 and 1250 mOsm/kg. The failing kidney loses its capacity to concentrate urine. A patient with polyuria due to chronic renal failure (CRF) is unable to produce either a dilute or a concentrated urine. Instead, urine osmolality in these patients is generally within 50 mOsm/kg of the plasma osmolality (i.e., between about 240 and 350 mOsm/kg). Urine osmolality is a measure of concentrating power of the kidney. Urine specific gravity is usually directly proportional to osmolality. Both give misleadingly high results if there is significant glycosuria or proteinuria. The error can be mathematically corrected. Measurement of osmolality with an osmometer is more accurate, but also more difficult than specific gravity measurements. Random testing of either specific gravity or osmolality is not very informative, due to the effect of fluid intake. Repeated measurements, or measurements under controlled fluid intake are more reliable. Specific gravity values of more than 1.025 or osmolality values more than 875 mOsm/kg indicate adequate renal concentrating ability. Recurring values of 1.010 (1.008-1.012) indicate isosthenuria (fixed specific gravity). This finding suggests loss of tubular concentrating and diluting ability and is frequently a prelude to anuria. The ratio is increased in conditions in which there is increased urea synthesis, as observed in the presence of blood in the GI tract, in muscle wasting disease, and in severe tissue trauma, all of which provide proteins that are catabolized into their constituent amino acids, which are then deaminated and converted into urea. Other conditions such as intraperitoneal extravasation of urine and urinary enteric fistulas lead to greater urea reabsorption. Increased tubular reabsorption of urea occurs with decreased tubular flow as a result of dehydration, decreased cardiac output, or shock (= prerenal azotemia), or due to renal disease, such as early acute glomerulonephritis, malignant nephrosclerosis, or postrenal obstruction. Decreased ratios are seen in the presence of decreased urea synthesis (chronic glomerulonephritis with protein deficiency, severe hepatic insufficiency, and starvation) and decreased urea reabsorption (overhydration and rapid hydration). The decrease in ratio due to hemodialysis is caused by the more efficient dialysis of urea vs. creatinine. In acute tubular necrosis, urea and creatinine are equally and passively returned to the tubular blood. Therefore, the ratio is decreased. Acute renal failure occurs rapidly and is potentially reversible if the initial illness or insult is survived (60% survival rate). Chronic renal failure usually develops over years in an insidious manner leading to endstage renal disease requiring lifelong dialysis or renal transplant. Acute diffuse inflammatory changes in the glomeruli with hematuria, RBC casts, mild proteinuria, and often hypertension, edema, and azotemia. The ratio of the clearances of a high and a low molecular weight protein (IgG and albumin, respectively) gives an indication of the nature of glomerular damage in glomerular proteinuria (selective vs. non-selective). The selectivity index is identical to the ratio, except that it is expressed in percent, (i.e., it is multiplied times 100). Slowly progressive glomerular disease. The syndrome is due to several diseases of different etiology. The disease is characterized by diffuse sclerosis of glomeruli, loss of nephrons, and loss of protein into the urine. The loss of protein leads to a decrease in oncotic pressure, resulting in edema. The decreased oncotic pressure stimulates a compensatory increase in hepatic lipoprotein synthesis, and, thus, hyperlipidemia is often seen in this condition. Increase in lipoproteins is also caused by loss of factors regulating lipoprotein synthesis. In the nephrotic syndrome there is a loss of a variety of proteins, such as transferrin, cortisol-binding globulin, thyroxine-binding globulin, and some coagulation factors. However, some coagulation factors are increased, e.g. Factor V and VIII, leading to thrombosis. Thyroxine-binding globulin may be decreased; accordingly, total T4 (thyroxine) may be decreased; thyroid function, however, is normal (normal free thyroxine). Total globulin concentration may be normal, but α2-globulins are increased (alpha-2 macroglobulin and low-density lipoprotein), and γ-globulins may be low (see serum protein section). Hence, serum protein electrophoresis typically demonstrates diminished albumin and elevated alpha-2 globulin fraction. The casts consist only of Tamm-Horsfall protein. They are excreted by the normal kidney in small amounts. Excretion of numerous casts is seen in all renal diseases associated with benign essential hypertension, and nephrotic syndrome. White blood cell (leukocyte) casts. These casts are formed when WBC's are incorporated into the protein matrix. They enter the urine stream by ameboid movement through and between tubular epithelial cells and sometimes they cross the glomerular capillary lumen. These casts are associated with diseases with leukocytic exudation and interstitial inflammation. Example: pyelonephritis. Presence of these casts indicates severe injury to the glomerular basement membrane. The reddish orange color is secondary to hemoglobin pigmentation. Erythrocytes (RBC’s) are biconcave disks packed in fibrin meshwork within the cast matrix. These casts are associated with acute glomerulonephritis (most common), lupus nephritis, Goodpasture’s syndrome, and subacute bacterial endocarditis (SBE). These casts are due to constant desquamation and renewal of the renal epithelium. Their presence points to a pathological process occurring in the kidney and affecting the tubular portion of the nephron (tubular damage). Epithelial casts are associated with exposure to nephrotoxic agents and exposure to some viruses. These casts are formed from breakdown products of cellular casts and immunoglobulins. There is a progression from coarsely granular to finely granular casts. These are the result of progressive degenerative changes occurring in cellular casts and they are associated with severe chronic renal disease and amyloidosis. These casts are probably due to leakage of lipoproteins through the glomerular filter and are associated with nephrotic syndrome, diabetes mellitus, and damaged renal tubular epithelial cells. A 73-year-old white man, with a medical history of non-small-cell lung cancer and idiopathic myelofibrosis with myeloid metaplasia, was prescribed levofloxacin 500 mg/d orally because of a lower urinary tract infection. Three days after starting treatment with levofloxacin, the patient was admitted to the hospital with palpable purpura and erythematous skin lesions over the lower limbs and trunk, with a markedly diminished urine output. His vital signs were BP 155/70 mmHg, HR 92 beats/min, RR 14 breaths/min, and (axillary) Temp 37.1°C. Initial patient labs (2 weeks prior to levofloxacin): creatinine 1.0 mg/dL, urea 38 mg/dL. On admission the patient’s serum creatinine concentration was 6.4 mg/dL and serum urea nitrogen 190 mg/dL. Serum electrolytes were normal. Hemoglobin and hematocrit were 8.4 g/dL and 24%. Bilirubin, aminotransferase enzymes, and alkaline phosphatase were normal; lactate dehydrogenase was also normal. Urinalysis disclosed 3+ proteinuria, with no casts or crystals, an acidic pH (5.0), and a reduced specific gravity (1.007). The daily urinary output was 0.6, 0.5, and 0.8 L over the first 3 days of the hospital stay, respectively. Cultures of peripheral blood and urine grew no pathogens. How do you interpret the initial creatinine and urea results? How do you interpret the admission creatinine and urea results? How do you interpret the hemoglobin and hematocrit? How do you interpret the bilirubin, aminotransferase and alkaline phosphatase? How do you interpret the urinalysis results? What is a probable mechanism for these findings? What medication recommendations would you have for treating this patient? A 49-year-old AIDS patient with multiple drug-resistant HIV gets tenofovir added to his drug regimen. His medical history was also notable for adrenal insufficiency, hypogonadism, anemia, peripheral neuropathy, asthma, and large B cell lymphoma of the thoracic spine. His serum creatinine level had ranged from 1.9 to 2.8 mg/dL, and it was 2.3 mg/dL just before he started receiving tenofovir. The patient had received enteric-coated didanosine formulation (400 mg/day) several months before tenofovir therapy was started. The patient returned for a follow-up visit 2 weeks after he started the new regimen, at which time the creatinine level was 2.0 mg/dL, bicarbonate 21 mmol/L and albumin 3.0 g/dL. Due to lower extremity edema he was prescribed furosemide. BUN 78 mg/dL, creatinine 7.6 mg/dL, arterial blood gas pH 6.93, bicarbonate of 5 mmol/L and lactate of 5.5 mmol/L (normal 0.5-2.2 mmol/L). No evidence of infection was found with blood culture. If the patient weighed 74.6 kg calculate his estimated GFR based on the creatinine of 2.3 mg/dL. Based on this creatinine are dose adjustments required for tenofovir? How do you interpret the lab values at the 2 week follow-up? How do you interpret the lab values at the 6 week follow-up? Calculate the patients estimated GFR at six weeks post therapy. Discuss the importance of knowing the renal status in patients dosed with tenofovir. What is this patient’s prognosis? An 87-year-old retired tailor appears in his physician’s office complaining of the slow onset of ankle and shin swelling, mild shortness of breath, and fatigue. Urinalysis performed in the office reveals marked proteinuria, and the patient is seen for further evaluation and work-up. The serum urea-N was 35 mg/dL, creatinine 3.8 mg/dL, sodium 136 mmol/L, potassium 5.6 mmol/L, chloride 104 mmol/L, and bicarbonate 20 mmol/L. Total serum protein was 4.3 g/dL with albumin 1.4 g/dL. Given a serum creatinine of 3.8 mg/dL, a urine creatinine concentration of 210 mg/dL and a 24 hour urine volume of 288 mL, calculate the creatinine clearance in this patient. Interpret the creatinine clearance you have obtained for this patient. What other blood/serum tests may be abnormal? What further studies should be performed on the urine of this patient? What type of casts may be present in urine? What is the differential diagnosis for this patient? Are the increased SUN and creatinine values typical for this disease? A 5-year-old girl develops swelling of her ankles and feet. Her anxious mother brings her daughter to the pediatrician. A urinalysis is performed revealing large amounts of protein. The girl is admitted in acutely ill condition to a local pediatric intensive care unit. Admission laboratory studies reveal: serum urea-N 15 mg/dL, creatinine 1.2 mg/dL, serum sodium 133 mmol/L, potassium 4.6 mmol/L, chloride 101 mmol/L, bicarbonate 23 mmol/L and calcium 7.4 mg/dL. Her serum cholesterol is found to be 350 mg/dL. The urine contained hyaline, granular, and fatty casts. What is the probable diagnosis for this patient? Describe the probable gross appearance of this patient’s serum. What would you expect the patient’s serum albumin to be (high, normal, or low)? Which other serum proteins are likely to be abnormal? Describe the mechanism for hyperlipidemia in this patient. Explain the low serum calcium (7.4 mg/dL) found in this patient. Describe the serum electrophoresis pattern. What type of urinary sediments would you expect?